Panning for gold is a great pastime and it will enable you to go home with a profitable return even if you don't find some gold nuggets with your new metal detector. How you do It, Including a video of simple instructions from a WA Champion Gold Panner Ed Ward. Why Learn How to Pan For Gold? Metal Detectors don't get all the small gold - Why go home empty handed? There might be commercial levels of gold in the soil - without nuggets being present. Loaming techniques may lead you to a Source of Primary Gold! 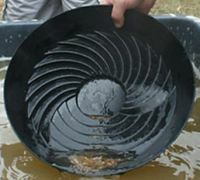 It's easy to learn, equipment is cheap and it's good fun panning for gold! The key point to remember with gold is that it has an high specific Gravity of 19.3. (Go to this page to find out about Specific Gravity). That means that whatever you include in the pan with gold with agitation in the water the gold will sink to the bottom of the pan - its just a matter of removing the unwanted soil to get to the gold. Thanks to Ed Ward and the Amalgamated Prospectors and Leaseholders Association for their support of Prospectors and Prospecting in West Australia. Screen off all the large material with a 1/4 or 1/8 inch screen. Break up the clay and clumps of dirt in the water with your hand. Hold the pan level and shake the pan/agitate and swirl the water around so the gold sinks to the bottom. Remove the material by tilting the pan and using wave action or your thumb. Continue to agitate the water and remove material until there is just a small amount of heavy material left. Recover the gold or save the heavy material for further processing later. Garrett Gold Panning Kit consisting of a gold panning dish, Screen, gold snifter, bottle and book on "How to Pan for Gold". Good value for a beginner. Screens to screen out larger material, the larger material can then be checked for nuggets. Screens come in a number of mesh sizes the ones shown here are 1/4 and 1/8th inch mesh. Gold pans come in a variety of sizes. Some are smooth and others have grooves or ridges in them to help trap the gold. Black is the best colour with green being next best to see the gold. 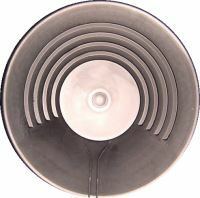 Pans also come in a variety of materials such as plastic and metal. Plastic pans are easier to maintain and lighter. Crevising tools to scrape material out of rock crevices for panning. Such as a screwdriver, knife, brush or a commercially available tool. Magnet for removing heavy magnetic material such as magnetite. Snifter bottles to remove fine gold from the pan. If water is an issue then a half a 44 gallon bucket that you can fill with water to recycle over and over for panning is handy. See this page Alluvial Gold. Refer to the table on that page to the section that is headed "Where to Look For the Deposited Gold" in the Alluvial Gold column. But dont think that is the only place to go panning, in another page on Loaming for Gold we will explain why panning can be very lucrative in other areas and maybe even lead you to the mother lode primary source! Return to Gold Prospecting home Page from Panning for Gold page.